Adal, A. M., Demissie, Z. A. and Mahmoud, S. S. (2016). EST-SSR Analysis and Cross-species Transferability Study in Lavandula. Bio-protocol 6(15): e1891. DOI: 10.21769/BioProtoc.1891. The genus Lavandula comprises of several economically important lavender species that are mainly cultivated worldwide for essential oil production. Identification of lavender species and their cultivars has been a huge bottleneck in lavender industries due to lack of appropriate identification mechanisms. Recent advances in modern technologies would help to address these identification issues through development of potential molecular markers, including simple sequence repeats (SSRs). SSRs can be developed from specific species, and can be potentially used for related species, which lack the source sequences to develop species-specific SSRs. Here, we describe the guidelines and steps of identifying and analyzing SSRs from expressed sequence tag (EST) sequences of lavender species. We also detail the validation procedures of selected EST-SSRs in distinguishing source (donor) species as well as related species. Expressed Sequence Tag (EST) databases containing approximately 23,000 sequences are developed for L. angustifolia and L. x intermedia plants (Lane et al., 2010; Demissie et al., 2012). The main steps of EST library development include total RNA isolation, mRNA purification and cDNA library construction, and partial sequencing of random cDNA clones at the 5' ends by Sanger sequencing. EST libraries are sorted manually based on the sources of two species, L. angustifolia and L. x intermedia, and are used for simple sequence repeats (SSRs) identification using web-based SSR analysis tools (Jung et al., 2008; You et al., 2008) (Figure 1). Sorted ESTs in FASTA format are further broken down manually into multiple files with maximum input sequences of 500 ESTs in BatchPrimer3 software (You et al., 2008). For each of input files, SSR screening parameters are set to pick up primer pairs and SSR motifs with minimum lengths of 12 bp for di-, tri- and tetra-nucleotides, 15 bp for penta-nucleotides as well as 18 bp for hexa-nucleotides. Then, additional parameter settings (minimum, optimum and maximum) are carried out for primer length (18, 21 and 25 bp), product size (120, 200 and 300 bp), GC content (40, 50 and 60%), Tm (50, 55 and 60 °C). Finally, screening of SSRs along with primer sets from input sequences are run, and the outputs are displayed as HTML format and saved as tab-delimited text or excel files for further analysis of SSR repeats. SSRs with potential primer flanking regions are further filtered out based on primers designed during SSR motif identification using the aforementioned tools. All identified SSRs with primer flanked regions are again characterized, targeting the length of repeats as longer category with SSR length of ≥ 18 bp for tri-nucleotides and ≥ 20 bp for di-, tetra-, penta and hexa-nucleotides, or with lower than those demarcations as shorter category. To predict the putative functional roles of the repeats under longer category, ESTs/unigenes containing SSRs with primer flanking regions are annotated against public databases using Blast2GO online platform (Conesa et al., 2005). In brief, ESTs containing repeats ≥ 18 bp are filtered and uploaded into Blast2GO, followed by blasting against the public database. Then, mapping of ESTs with Blast hit are continued prior to the final putative functional annotation. Lastly, based on the detected annotations, characterization of gene ontology (GO) annotation and putative functions of SSR containing ESTs are made. Figure 1. Overview of SSRs analysis from EST libraries of lavender species and validation of identified SSR on source as well as related Lavandula species. Major steps of SSR analysis from ESTs and subsequent validation include: (1) EST library development; (2) SSR motif identification using web-based mining tools; (3) SSR characterization, primer design and custom-synthesis of primers; (4) genomic DNA isolation; (5) PCR amplification of expected SSR motif-containing fragments; and (6) resolution of DNA fragments on polyacrylamide gel for scoring of amplicons as presence (1) or absence (0). Selected primer sets from aforementioned procedures are custom-synthesized and resuspended in 10 mM Tris (pH 8.0) buffer and stored at -20 °C until use. Fresh young leaves (~100 mg) per sample of both source and related species (Figures 1 and 2) are ground with liquid N2 to a fine powder with mortar and pestle, and transferred into 1.5 ml centrifuge tube containing 450 µl cell lysis buffer (GP1 or GPX1) and RNase A (5 µl) from the plant genomic DNA extraction kit. 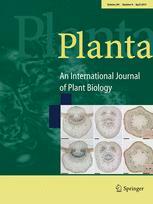 Note that GPX1 is used for samples of mature leaf tissues (Figure 2B), mostly rich in phenolic compounds. The samples are then incubated at 60 °C in water bath for 10-15 min, mixing by inverting every 5 min. The remaining procedures are done according to the kit's instructional manual. Finally, each of the samples is eluted with a total of 40 µl elution buffer with two round elution (25 µl and 15 µl, respectively) after 3-5 min incubations at room temperature. Eluted genomic DNA (gDNA) is quantified using NanoDrop 2000 spectrophotometer (1 µl elution buffer for blank and 1 µl gDNA for each sample). To check the gDNA integrity, 10 µl of the gDNA (100-300 ng) mixed with 1 µl of 10x loading dye and autoclaved water is loaded into each well of an agarose gel (1%) and run on horizontal gel electrophoresis with 1x TAE buffer at 80 V for 30-45 min (Figure 3). DNA image is then visualized and taken by the Gel Imager (Figure 3). Finally, a working solution is made for each sample into 50-70 ng/µl and stored at -20 °C until use. Figure 2. L. x intermedia cv Grosso plants for genomic DNA extraction. A. Young plants. B. Mature plant. Figure 3. Agarose gel (1%) resolution of genomic DNA samples (200 ng/well) isolated from young leaf tissues of L. x intermedia (lanes 1-5) and L. angustifolia (lanes 6-12) plants. M, 1kb DNA ladder (300 ng). PCR amplification for each primer set is performed by touch-down PCR using a two-stage amplification program (Figure 1). For the first stage, the Thermocycler is set to 15 min denaturation at 95 °C followed by 11 cycles of 30 sec denaturation at 95 °C, 30 sec annealing at 64-54 or 62-52 °C (depending on the primer type) with dropping of 1 °C in every cycle for annealing and 2 min at 72 °C for extension. For the second stage, the Thermocycler is programmed to perform 24 cycles at 95 °C for 30 sec, 54 °C or 52 °C for 30 sec and 72 °C for 2 min, and completed by a final extension at 72 °C for 10 min. The PCR amplified products are separated on a 6% polyacrylamide gel (Figure 4). Samples that are well mixed with loading dye (9 µl PCR products and 1 µl 10x loading dye) are loaded into gel wells using standard 1-200 µl volume pipette tips. One well is left empty to load a DNA ladder mix containing 0.35 µl of 50 bp DNA ladder (1 µg/ µl), 1 µl of 10x loading dye and 8.65 µl of autoclaved water. Once all samples and DNA ladder are carefully loaded, the gel is run in vertical gel electrophoresis using 0.5x TBE buffer at 160 V for approximately 45 min. The gel is then carefully transferred into a plastic container with 50 ml 0.5x TBE buffer supplemented with 1 µl SYBR safe and rocked for 30 min. After a quick rinse of the stained gel with fresh 0.5x TBE buffer, a gel image is taken using the Gel Imager (Figure 4). Figure 4. 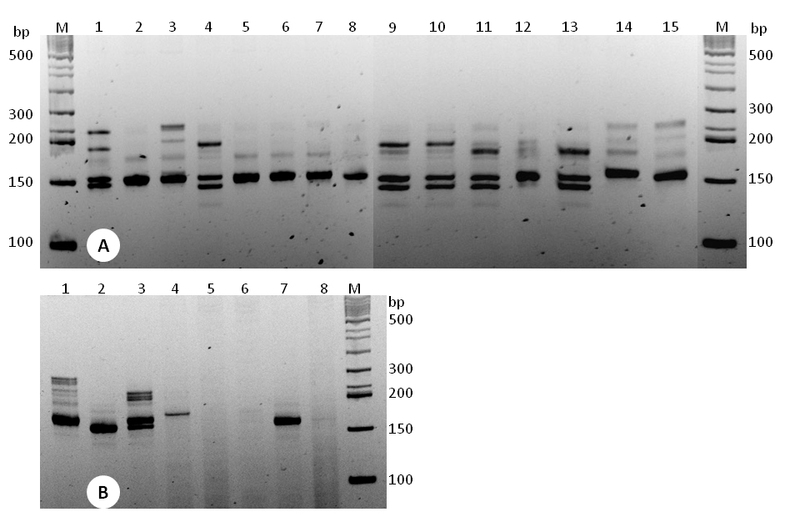 Polyacrylamide gel (6%) resolution of EST-SSR (LAF15) amplicons from (A) samples of L. angustifolia (lanes 1-9) and L. x intermedia (lanes 10-15) plants, and from (B) samples of related species, including L. angustifolia (lane 1) and L. x intermedia (lane 3). M, 50 bp DNA ladder; lane 2, L. latifolia; lane 4, L. buchii; lane 5. L. dentata; lane 6. L. lusitanica; lane 7, L. x ginginsii; lane 8, L. stoechas. Mature leaf tissue may contain large amounts of phenolic compounds that can co-purify with genomic DNA, and interfere with the subsequent PCR amplification reactions. Thus, extra caution must be taken on selection of tissue for DNA extraction. Young and fresh leaf tissues (Figure 2A) often give better DNA than mature and dry tissues. This protocol was adapted from the previously published study, Adal et al. (2015). This work was supported through grants and/or in-kind contributions to SSM by UBC, Genome British Columbia, Natural Sciences and Engineering Research Council of Canada, Agriculture and Agri-Food Canada and the BC Ministry of Agriculture (through programs delivered by the Investment Agriculture Foundation of BC). Adal, A. M., Demissie, Z. A. and Mahmoud, S. S. (2015). 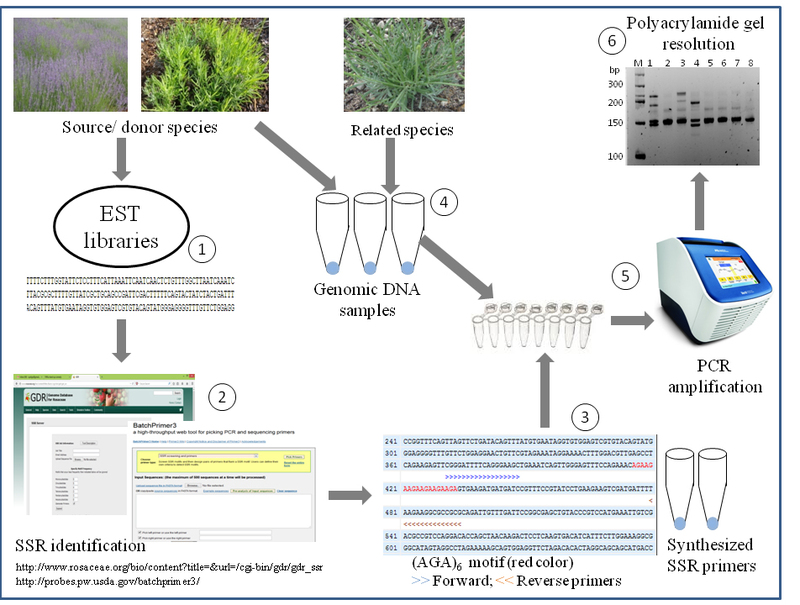 Identification, validation and cross-species transferability of novel Lavandula EST-SSRs. Planta 241(4): 987-1004. Conesa, A., Gotz, S., Garcia-Gomez, J. M., Terol, J., Talon, M. and Robles, M. (2005). Blast2GO: a universal tool for annotation, visualization and analysis in functional genomics research. Bioinformatics 21(18): 3674-3676. Demissie, Z. A., Cella, M. A., Sarker, L. S., Thompson, T. J., Rheault, M. R. and Mahmoud, S. S. (2012). Cloning, functional characterization and genomic organization of 1,8-cineole synthases from Lavandula. Plant Mol Biol 79(4-5): 393-411. Jung, S., Staton, M., Lee, T., Blenda, A., Svancara, R., Abbott, A. and Main, D. (2008). GDR (Genome Database for Rosaceae): integrated web-database for Rosaceae genomics and genetics data. Nucleic Acids Res 36(Database issue): D1034-1040. Lane, A., Boecklemann, A., Woronuk, G. N., Sarker, L. and Mahmoud, S. S. (2010). A genomics resource for investigating regulation of essential oil production in Lavandula angustifolia. Planta 231(4): 835-845. You, F. M., Huo, N., Gu, Y. Q., Luo, M. C., Ma, Y., Hane, D., Lazo, G. R., Dvorak, J. and Anderson, O. D. (2008). BatchPrimer3: a high throughput web application for PCR and sequencing primer design. BMC Bioinformatics 9: 253. How to cite: Adal, A. M., Demissie, Z. A. and Mahmoud, S. S. (2016). EST-SSR Analysis and Cross-species Transferability Study in Lavandula. Bio-protocol 6(15): e1891. DOI: 10.21769/BioProtoc.1891.